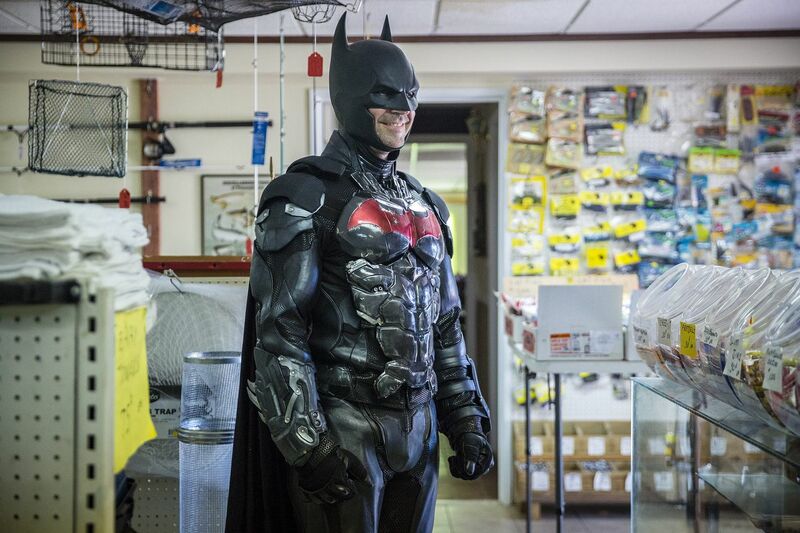 Bob Gable dressed up as the Bucks County Batman in Ed's Bait and Tackle Shop in Bensalem, where he gained social media fame when a video of him cleaning up graffiti for the store went viral. Meet Bob Gable, whose alter ego is Bucks County Batman. Holy costumes, Batman! Gable's custom-made Batsuit and the associated accessories cost him about $12,000. His 7-year-old son has more than 200 superhero costumes of his own. Crimes and misdemeanors: Bucks County Batman’s first official bit of street justice came in June, when video of him painting over graffiti for a Bensalem bait-and-tackle shop went viral. By night, mild-mannered Bob Gable serves up cocktails at Parx Casino. But by day, he serves up street justice as a fighter of criminal mischief and collector of insane superhero gear. "My slogan is 'Making Bucks County great again,' " Gable said. A divorced dad of two from Bensalem, Gable, 41, has loved comic books since childhood and he's been a costume aficionado for about a decade. But what started out as a Halloween-costume hobby has morphed — like Bruce Banner — into a hulking monster of a collection. Gable's Batsuit — which is custom-made and loaded with accessories including a voice changer — cost him about $12,000. His custom-made costume from Iron Man, War Machine, won him best overall costume at Philadelphia's Wizard World conference in 2015. That one cost only about $7,000. This War Machine costume won Bob Gable best overall costume at Wizard World 2015. His older son has three separate closets to contain his 200 superhero costumes — one for Marvel, one for DC, and a third just for Spider-Man. Just one of the closets dedicated to superhero costumes in the Bensalem home of Bob Gable. Superhero toys decorate every surface of Gable's home, bat decals dot the walls, and when he opens his car door, a purple light projects a bat signal onto the ground. He's got a soundproof room in the basement that's wallpapered with Marvel comics and even his paper towels are superhero-themed. Obviously, this is not a mild interest or an armchair hobby for Gable. But ask him the origin story behind his superhero obsession and he clams up. Gable is so quiet and brooding he makes Christian Bale's Batman look chatty. But what is evident is how superheroes have helped him to connect with his boys, ages 7 and 3. "Buying the costumes for my son and wearing them and playing in them has brought us a lot closer," he said. "Now his little brother just started to dress up. He just got his first costume. It's Thanos. He's the bad boy." Bob Gable dressed as the Bucks County Batman in his workshop in his Bensalem house. Gable used to buy his superhero suits on Amazon, but then a coworker introduced him to designers who, just like The Incredibles' Edna Mode, create custom-made superhero suits that he can order online. "I've had designers from Beijing, Australia, Thailand," he said. "There is a whole community of people who do this." The costumes often arrive in hundreds of parts, which Gable has to assemble. Then he'll add the lights, electronics, and other elements. The process can take months. Gable's current Batsuit — yes, he's had others — has pieces from all over the world. The pants and jacket are a motorcycle suit from UD Replicas, and the rest is custom-made. For the first few months, Gable just wore the suit while riding around Bensalem on his motorcycle. Then he began to make videos like this one, in which Bucks County Batman karate-chops a watermelon. Or this one, in which Bucks County Batman goes to Wawa to buy milk. He posts them to a YouTube page he created for his son. But it wasn't until June that the Bucks County Batman tackled his first real crime. A villain by the name of Tank who'd repeatedly spray-painted the bridge near Ed's Bait & Tackle shop in Bensalem had struck again. The shop owner's son, Eric Brodecki, took to Facebook, offering free shiners and worms to whoever could bring Tank to justice "so he can answer for his war crimes." Gable answered the call. He arrived in costume with a large roller brush and painted over the graffiti. Brodecki's brother, Gordon, filmed his good deed and posted it to social media. Soon, Bucks County Batman was featured on Fox29 and in a local paper, the Bucks County Courier Times. "It was a nice thing that he did for my dad," Eric Brodecki said, noting that Tank the Tagger has not returned. "I think Bucks County needs its own Batman. We don't have a hero." Gable said he's been inundated with messages on his Bucks County Batman Facebook page asking him to appear at birthday parties, charity events, and the hospital bedsides of sick children. For this man of few words, the attention has been overwhelming. But he hopes, like all Batmen, to use it as a force for good. "It's just nice to make people happy," Gable said. Known across the country as Jelloman, Paul Vile is a music festival hustler and Kurt Vile's brother. David Puryear brings good vibes and good music to Old City's streets with his 32 signs and his saxophone, Miss Nasty.